Sometimes you don't know whether to laugh or to cry... for me it is now always the former with MCF. Today I found some time and dropped by GACC (Grand Asian Chess Challenge?) being held at Universiti Malaya (MU) to fulfil an appointment made with some foreign friends participating and I was well and truly shocked how bad the event was. Yes, it is a long standing competition started by chess enthusiasts at MU but now as my friends there put it, a dying event having been reduced to a mixed swiss tournament? I don't blame the students organising, from what I saw they were hardly chess players and clearly lacked not only guidance but despite the MCF President apparently recently named as its Pro Chancellor (how low MU has now fallen!) there has been clearly no effort on his part to help this event but then again that is what he has always been all about. Then by accident I clicked on an old link later today and saw to my surprise that the long untouched MCF website (see http://malaysiachess.com/) actually had an update! Yes, no less than Yeap Joo Hock had apparently taken on the job of being MCF webmaster or perhaps he felt that the news was so important someone had to do it and it was about the very same MCF President being appointed FIDE VP for South East Asia Chess Development. Immediately I remembered in Tromso last August how Tan Sri (with Greg doing his running) was trying to get illegally elected ASEAN Chess Confederation (ACC) President by going around for signatures from delegates (failing miserably of course) notwithstanding the ACC meeting and elections was in June of this year. For his trouble and for voting against his own Deputy President and Hon. 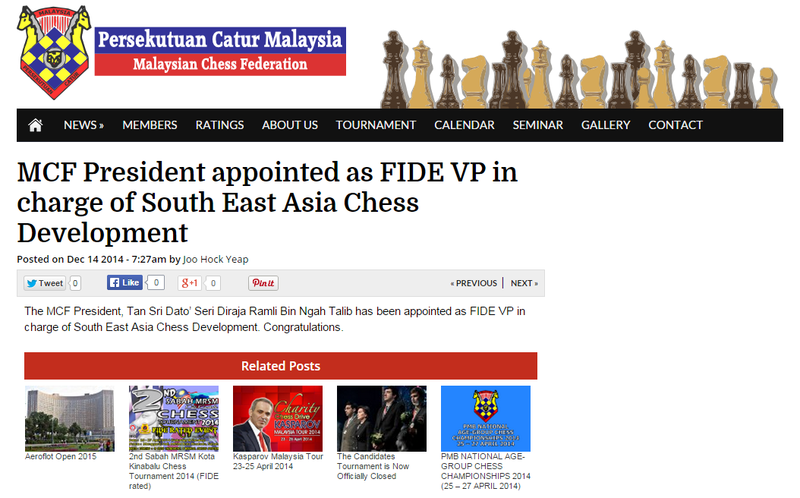 Secretary whom he endorsed earlier at the Asian Chess Federation (ACF) elections, Tan Sri was apparently rewarded with an appointment to the position of Vice President but there is sadly (for him) no record of this important achievement on the ACF website. ACF instead lists a Board of Directors, its FIDE Executive Board Members, and Zone Presidents. I have many friends in ACF, many are real chess people and know that a united Asia is stronger with FIDE and they clearly wish the current ACC leadership well and are also supportive. However I am also sure ACF would have found many VP positions to give away to try and make all happy and that most certainly the MCF President is not a FIDE Vice President (Some in FIDE was a little shocked when I asked) but does Tan Sri know the difference or is Yeap confused too or just misinformed? Still, VP whatever, in charge of South East Asia Development? Perhaps Greg should tell him to start with doing something tangible in a nice country he lives in called Malaysia. Like pay the arrears instead of finding yet another Deputy to use? Or at least to learn to play chess.